It's impossible to make a living on the federal minimum wage of $7.25 an hour. Millions of minimum wage workers are forced to rely on federal assistance programs to make ends meet. The minimum wage is worth less today than it was in 1968, when adjusted for inflation, and Congress doesn't appear willing to change that anytime soon. While the federal minimum wage hasn't budged since 2009, many states haven taken it upon themselves to raise wages. Most recently in November, four states passed ballot measures to increase the minimum wage to at least $12 an hour by 2020. But that still falls short of the $15 an hour wage that low-wage workers have been fighting for for years. On Tuesday, thousands of workers across the country took to the streets to fight for a $15 minimum wage and the right to unionize. The protests were organized by the Fight for $15, an advocacy group that was started by fast food workers in New York City. Tuesday's protests marked the four-year anniversary of the movement. Many of the protesters were fast food workers. Uber drivers and airport workers also joined the fight on Tuesday. Below, protesters march at a rally at Newark Airport in New Jersey. Protesters also came out in opposition to President-elect Donald Trump's plans to deport millions of undocumented immigrants. Protesters carried signs that said "No Deportations" in Los Angeles. Heavily armed Los Angeles police officers watched protesters from the back of a truck. According to the LA Times, 40 people were arrested at a peaceful protest in Los Angeles. Protesters were driven off in a police bus. According to USA Today, about 25 people were arrested at a protest in New York City. Protesters were also arrested in cities across the country. Last year, New York's Gov. Andrew Cuomo passed a law that will gradually increase the state's minimum wage to $15 over the next few years. But that didn't stop protesters from fighting for the cause on Tuesday. 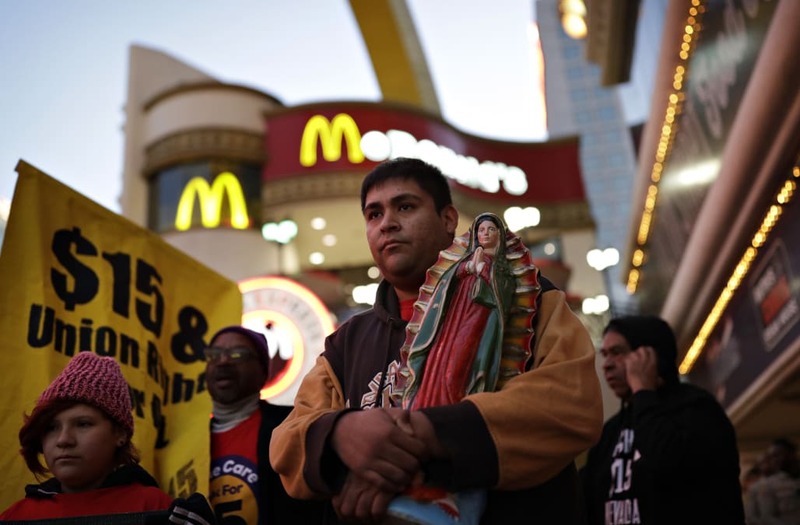 A crowd of about 350 protesters stood in front of a McDonald's restaurant in New York City.